Big thanks to Carley's dad for hooking us up with tickets in Nashville to see the Tennessee Titans play the Indianapolis Colts. Not only that, but Carley's brother Barrett and his wife Molly flew up from Gainesville for the game! It was really great hanging out with them. Tail-gating was in full swing as we approached the stadium. This game is called "corn-hole". Seriously! Ya gotta love The South. 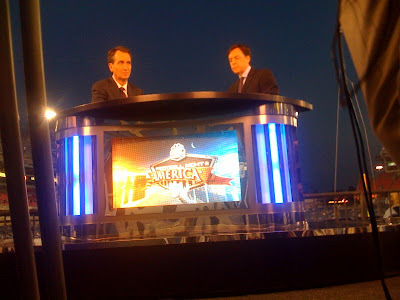 Since it was a Sunday night game, the NBC crew of Cris Collinsworth and Bob Costas was in town for a nationally-televised broadcast. Carley's dad got this photo, but we're still not quite sure of the whole story. Unfortunately for the locals, there were no fireworks for the Titans, as they continued their losing streak against the Colts, losing 31-9 for an 0-5 record on the season. And this from a team that started off last year with a 13-0 record and nearly went to the Super Bowl! The next day morning we took a leisurely 4-hour drive home down the Natchez Trace.